Cogeim manufactures Filters, Filter-Dryers and Vacuum Dryers for the pharmaceutical and chemical industries. 3V Tech’s Cogeim division has been a world-leading supplier of Solid-Liquid Separation equipment to the pharmaceutical, fine chemical and chemical industries for 40 years. Flexachem is a leading distributor for 3V Tech Cogeim and we supply Thin Film Dryers, both vertical and horizontal arrangement, for continuous drying single-pass operation, very effective in processing high sensitive products and when strong product de-watering is required, paddle dryers and filter-dryers for batch operation. Pressure filtration is a very efficient method to separate solids from liquids, whether the product is the solid or the liquid. The required energy consumption is minimal and, in most cases, pressure filtration does not require specific temperatures, thus preserving product from any thermal shock. Pressure filtration is normally performed in pressure vessels, with the highest guarantee of the absence of any product or environment contamination. Solid-liquid separation is traditionally obtained using “Nutsche” type pressure filters. When drying is required or when the transfer of wet cakes to a dryer impacts product quality or is potentially hazardous to operating personnel, 3V Cogeim has specialised equipment that can combine pressure filtration and vacuum drying. Cogeim filters are specially designed for solid-liquid separation. By adding a heating system to the side walls, introducing a heated agitator and operating under vacuum conditions, they can be transformed into Filter-Dryers. A Filter-Dryer can be loaded with a concentrated slurry and discharge a dry powder. 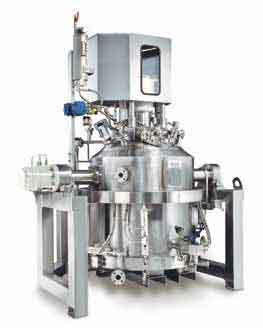 Cogeim Filter-Dryers are a deep bed, solid-liquid separation systems that use a filter screen to promote the development of the filter cake. nutsche filter-dryers that meet the challenge of the most demanding applications. Continuous filtration is adopted where high throughput production in combination with relatively compact size equipment are desired. Cogeim’s continuous Filters provide the benefit of very low energy consumption and a fully sealed and contained construction. They meet the stringent requirements for operator safety and containment of toxic products. Cogeim offers alternative filtration technologies for thick cakes combined with high pressure and for thin cakes combined with lower pressure conditions. If you have a specific requirement, please contact our Process Equipment Specialist to discuss your application in more detail.